Every once and awhile, I need to stop, organize and regroup. I like to do this right after we’ve had a large increase in the number of new readers (welcome). It also generally means things may have gotten a bit out of control. Both are the case right now. As I mentioned in the last post announcing the Mistral Blanket, Tahoe is still stuck in winter and I’m way behind in my spring knitting. I also got a little carried away starting new projects. I have so many projects going at once that I had to categorize them by season and by Nuance so I could decide what to finish up next. The majority of our patterns are free. That’s because whenever I announce a new technique, I like to partner the idea with a pattern that shows you how it works. The design is usually a straight forward so you can focus on the new skill, hence all the scarves and shawls (for now). Does that mean I don’t have more complex designs floating around in my little head? Not at all. Those designs, including sweaters, use a combination of Nuances some of which haven’t been announced yet. For example, I am fiddling with a sleeve join and I don’t have it quite right yet. I am not an expert finisher myself, so I’m always looking for foolproof ways to finish garments. “Start with Step A, follow with Step B and it looks good” kind of techniques. And so I pile up sweaters that are knit up to the armhole. It’s quite a strange (but pretty) pile of UFOs. We also refer to new techniques as ‘Nuances’ because they’re mostly take offs on existing knitting techniques. What makes these guys favorites? They tend to be the easiest to apply to your other projects and definitely have the most views. The Hatch Edge just passed 30,000 views on our blog. Let’s say you fall in love with one of our Nuances and want to use it in a pattern, how do you know where it’s used? There’s nothing like a graphic to simplify things. These are all the techniques and patterns that we’ve announced so far. If you’re new to the blog you may have missed some of our core techniques. Not to worry, here they all are. The techniques are numbered and matched to the patterns were they are used. Our 3 difficulty levels are: Easy, Medium and Complex. I picked Complex vs. Difficult on purpose. By design, none of the techniques or patterns are really hard. One of the benefits of the Showy Decrease is that it’s easy to spot while you knit. Easy designs have Showy Decreases that line right up for you. The Complex patterns combine more techniques, several ways to use the Showy Decrease and non-linear decreases. That doesn’t make the techniques more difficult but it does mean you have to pay more attention. Many patterns or related blog posts include a swatch so you can test the techniques first. Here are a few pattern favorites if you’d like to try something new. The Manchester Scarf demonstrates the benefit of matching right and left Showy Decreases. Estrellita Hat (there’s a blanket too) reached #1 in Ravelry! 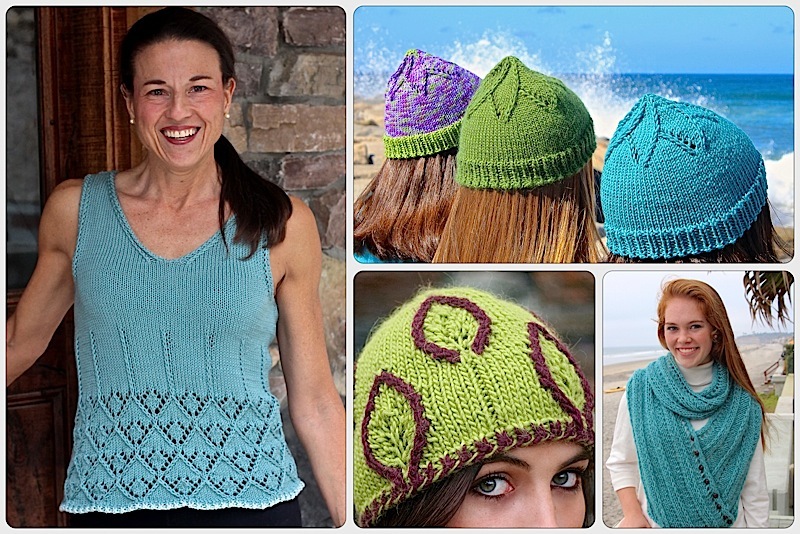 It shows you how Showy Decreases create deep ribs, textured patterns and beautiful hat tops. High Sierra started our exploration of using Showy Decreases to update stitch patterns. It also has pretty cast on and bind off edges. The Rubicon Bay Scarf is part of my most ambitious project to date, a free 21-page e-book introducing Showy Garter. I love (love) what the Showy Decrease does for plain garter stitch. There are a lot more projects like the one below just waiting for pattern writing. Blogs are a wonderful way to communicate new information. It is my primary teaching tool and works hand in hand with our patterns. However, blogs are by necessity chronological. That’s why we also have a website. There all the techniques are summarized on one page and all the patterns are organized by skill level and by technique. All this planning worked and helped me decide what to postpone to fall and what warm weather knitting to focus on next. Just for fun, I wanted to show you how this organization project started. I used a project management program to layout all the Nuances and patterns then match them up. My head exploded at the end of the exercise so I thought I would spare you the same fate by building the table above. Now, back to work Laura. I am amazed of how you share your passion !!! Thank you soooo much !!! I love using the Hatch Edge! Now I am trying to incorporate some buttonholes without losing the pattern. Have you already done this? I’ve almost got it, but don’t want to re-invent the wheel. This entry was posted on April 30, 2017 by Laura Cunitz in Free Downloads, Getting Started, Nuances, Patterns.